The causes of adult laryngeal and upper tracheal stenosis are trauma, chronic inflammatory diseases (eg, amyloidosis, sarcoidosis, relapsing polychondritis), benign neoplasm (eg, respiratory papillomatosis), malignant neoplasm (eg, primary tracheal, secondary invasion, metastatic), and collagen vascular diseases (eg, tracheopathia osteoplastica, Wegener granulomatosis). The sequence of events that leads to laryngeal and upper tracheal stenosis in adults involves ulceration of the mucosa and cartilage, inflammatory reactions with associated granulation tissue, fibrous tissue formation, and contraction of fibrous scar tissue. Capillary perfusion pressure is a crucial consideration in mucosal injury, and mucosal ischemia is produced by direct contact with an endotracheal tube segment or by an increase in the pressure in the tube cuff. Ulceration is the earliest laryngotracheal injury that is produced by an endotracheal tube (see the images below). Ulcer healing involves regeneration of the epithelium (primary healing) or repair (secondary healing). If the regenerated epithelium fails to cover the granulation tissue (ie, pseudopapillary or nodular granulation tissue), the growth of the granulation tissue becomes exaggerated. After weeks or months, the once-vascular tissue becomes an almost avascular scar that contains only a few widely separated blood vessels. The linear tomogram shows the larynx (red line), stenotic trachea (blue line), ventricular bands (blue arrow), laryngeal ventricles (green arrow), true vocal cords (red arrow), and tracheostomy site (black arrow). 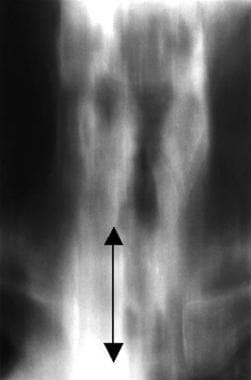 The linear tomogram shows a stenotic segment below the left vocal cord. The double-headed arrow indicates the stenotic point in the trachea. 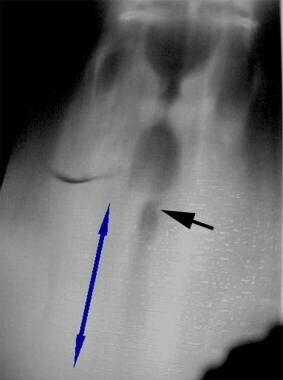 The linear tomogram shows a long stenotic tracheal segment (double-headed blue arrow) above a tracheostomy site (black arrow). The image was obtained to observe a segment of sound trachea. 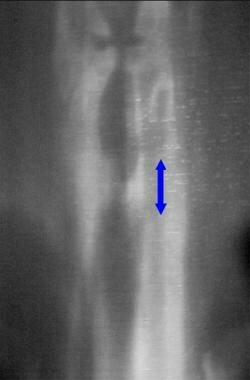 The linear tomogram demonstrates tracheal stenosis. 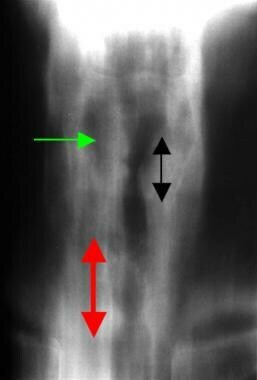 The linear tomogram shows the larynx and a long stenotic tracheal segment (double-headed red arrow) that begins above the tracheostomy site (black arrow) and extends to two thirds of the trachea. 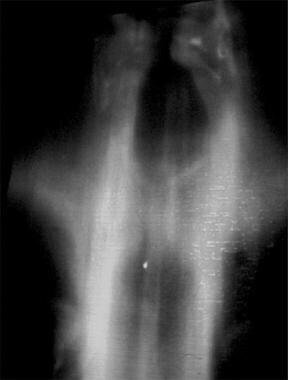 This linear tomogram was obtained from an asymptomatic patient with osteopathic tracheopathy who was undergoing elective nasal surgery. 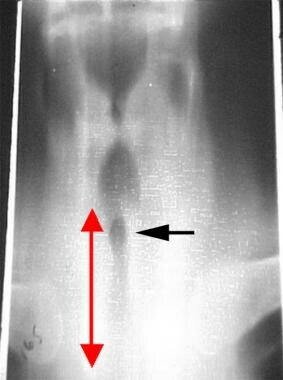 This linear tomogram was obtained from a patient with a respiratory scleroma and tracheal stenosis in the cervical trachea (double-headed red arrow). The green arrow indicates the pyriform sinus, and the double-headed black arrow indicates the larynx. 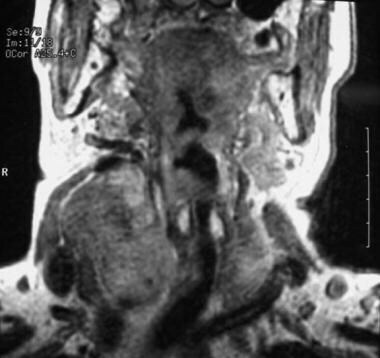 Goiter -associated tracheal compression is demonstrated in the images below. 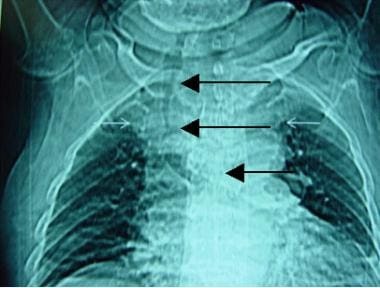 The chest radiograph shows an intrathoracic goiter with tracheal compression and deviation (arrows). These axial computed tomography scans were obtained from a patient with an intrathoracic multinodular goiter that is compressing the trachea. 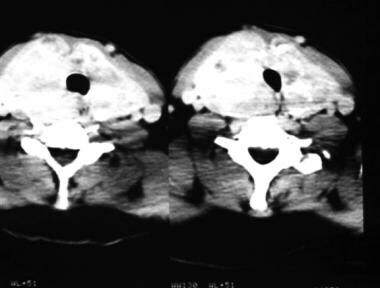 These axial CT scans were obtained from a patient with a multinodular goiter that is compressing the cervical trachea. 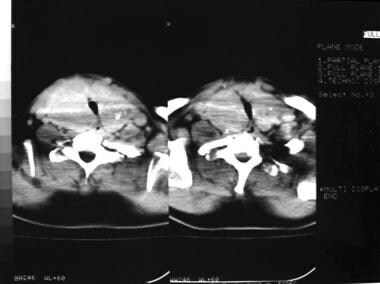 This image is a sagittal computed tomography scan reconstruction in a patient with a multinodular goiter that is compressing the tracheal lumen. These computed tomography scans show an intrathoracic goiter that is compressing the trachea. 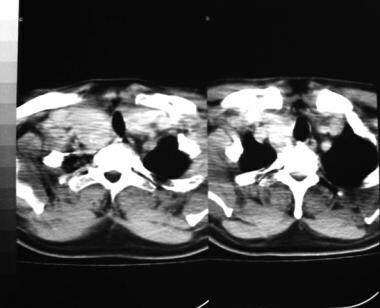 The computed tomography scan was obtained from a patient with papillary carcinoma in a multinodular goiter. 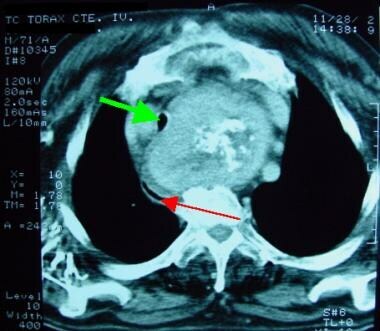 The image demonstrates compression and deviation of the trachea (green arrow). The red arrow indicates the esophagus. In 1880, William MacEwen first reported endotracheal intubation for anesthesia,  and in 1969, Lindholm reported injuries to the larynx and trachea after intubation for this purpose. The current use of high-volume, low-pressure cuffs has almost eliminated the tracheal lesions that are caused by pressure from the cuff of the endotracheal tube. However, the number of intensive care patients who require intubation and artificial ventilation has increased dramatically. Freitag and colleagues proposed a new classification method that is based on a detailed description of the type, location, and degree of the airway stenoses. The type of stenoses includes the 2 groups structural stenosis and dynamic stenosis. Structural stenosis includes stenosis due to all types of exophytic intraluminal malignant or benign tumors and granulation tissue; extrinsic compression; narrowing due to airway distortion, kinking, bending, or buckling; and shrinking or scarring (eg, postintubation stenosis). The degree of stenosis is assigned by a numerical code, as noted in Table 1. A thorough patient history should be obtained, with a complete medical history that is directed toward any previous airway intervention (intubation or tracheotomy) and head and neck, thoracic, or trauma surgery. Upper airway dysfunction in acute fulminant processes may be obvious on simple examination of the patient, but chronic subtle cases are more difficult to diagnose. Complete evaluation of the airway requires a thorough knowledge of its anatomy and physiology. The larynx, hypopharynx, and proximal trachea are assessed with an indirect mirror examination, a 70° or 90° telescope, or a flexible, fiberoptic nasolaryngoscope. Laboratory evaluation in patients with tracheal stenosis can demonstrate changes in serum electrolyte levels, acid-base balance, blood-oxygen level, and red blood cell count. The endoscopic evaluation can be subjective and dependent on the endoscopist's skills. Other technical limitations include the inability to evaluate the airway caliber and morphology beyond a high-grade stenosis of the bronchial lumen, difficulty passing the endoscope through severely narrowed airway sections, the scarce information that may be obtained about the extent of any extraluminal disease, and patient intolerance of the procedure. Few contraindications exist for endoscopic examination, but cervical spine disorders and coagulopathy are among them. Patients who have significant airway compromise should not undergo flexible endoscopy unless rigid endoscopic equipment and an experienced team are readily available to establish an adequate airway in emergent situations. Rigid laryngotracheobronchoscopy is useful for the diagnosis and therapy of tracheal stenosis, but this procedure should be performed with general anesthesia. Flexible endoscopy is better for diagnosis and can be performed with local anesthesia (see the videos below). This video demonstrates the 90º endoscopic view in 2 patients with tracheal stenosis. This video of a 90º endoscopic tracheal view was obtained from a patient with postintubation tracheal stenosis. Technological advances in CT scanning and MRI have greatly improved radiologists' ability to image the upper airway. Spiral CT scanning and fast MRI techniques allow the use of rapid acquisition speeds that decrease degradation motion artifacts caused by patients breathing and swallowing and carotid artery pulsations. Helical CT scanning with 3-D reconstruction and virtual endoscopy in neonates and infants can prevent additional diagnostic tracheobronchoscopy in a high percentage of such patients who have tracheobronchial lesions. 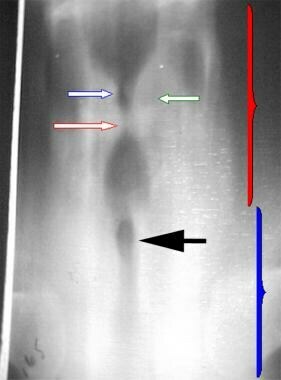 Conventional plain films (ie, AP and lateral projections and images obtained with selective high-kV filtration techniques) of the larynx provide preliminary or definitive information about foreign bodies, trauma, and other types of acute and chronic airway obstruction. These radiographs can demonstrate soft-tissue swelling, alterations of the cartilaginous framework (if it is sufficiently calcified), and the position of the air column (see the image below). Xeroradiography, with its capacity for edge enhancement, can be used to clarify intrinsic soft-tissue detail (eg, calcifications), delineate masses and stenoses, sometimes depict cartilage abnormalities (eg, fractures, erosions), and identify foreign bodies by their type and location. Unfortunately, the radiation exposure with this technique is 3-5 times that of conventional radiography, and xeroradiography is rarely used because of the high cost of leasing the equipment. Using radiologic guidance and local anesthesia, Profili and colleagues evaluated endoscopic airway stenting in 16 patients with malignant tracheobronchial stricture. The authors reported good visualization of the stenotic tract and satisfactory control of the positioning stent before and during release. The procedure was also less invasive, more rapid, and more cost-effective compared with a combined endoscopic/fluoroscopic technique. The variability of calcification in the laryngeal cartilages can create a diagnostic problem. CT images of tracheal stenosis are displayed below. This axial contrast-enhanced computed tomography scan was obtained from a patient with a deep neck abscess in the visceral compartment. The image shows significant compression and deviation of the trachea. This axial contrast-enhanced computed tomography scan is from the same patient as in the above image. The acquired images provide detailed information regarding the tracheobronchial tree and its associated pathology. Moreover, 2-D and 3-D images that are generated by CT scan data provide additional information regarding airway pathology. A variety of computer-processing algorithms can be applied in acquired CT scan data, including multiplanar reformatting (MPR), shaded surface display (SSD), maximum or minimum intensity projection (MIP), and volume-rendering techniques (VRT), as well as a more recent technique, virtual endoscopy (VE). Conventional coronal CT scanning allows visualization of the frontal view anatomy without a superimposed spine. 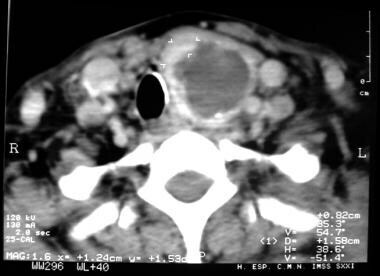 This technique enables satisfactory analysis of the vertical extent of the tracheal stenosis or stricture, but conventional coronal CT scanning is only used occasionally because of its limited gray-scale ability to differentiate soft tissue. However, airway images, especially with the added sagittal projection, are excellent. The best compromise among the combined factors of CT-scan airway measurement precision, patient breath-holding time, and total x-ray dose is the use of a 3-mm section thickness, a reconstruction interval of 1.5 mm, and a maximal pitch of 1.3-1.5, as well as the application of the edge-enhancing modus. Inner-surface reconstructions that are calculated from helical CT scan data sets offer a diagnostic option for upper airway assessment. With special software, it is possible to create a virtual and continuous endoscopic overview of the inner surface of a hollow viscera on a monitor; these images are similar to endoscopic views and have been compared with the intraoperative findings in patients with laryngeal or tracheal stenoses. Excellent results have been reported and have led to the conclusion that virtual endoscopy offers a valuable overview for assessing the extent and location of the stenoses. Xiong et al reported the sensitivity of CT scan-based virtual bronchoscopy (CTVB) in detecting central tumors as 93.3%, with an accuracy of 93.5%. A study by Hoppe et al resulted in a 90% sensitivity for detecting stenoses of the central airways with CTVB, a specificity of 96.6%, and an accuracy of 95.5%. Furthermore, Koletsis and colleagues demonstrated that detection of tracheal stenoses with VE was comparable to that of fiberoptic bronchoscopy, but VE had the added advantage of detecting additional stenoses beyond the areas the bronchoscope could not traverse. These findings possibly indicate that VE has high diagnostic yield in the setting of multiple stenotic lesions. 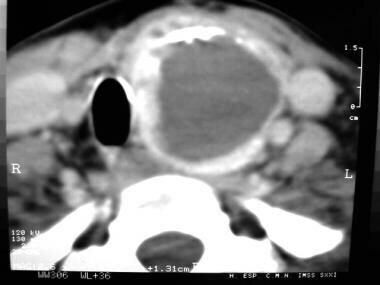 Disadvantages of CT scanning include its cost, radiation exposure, limitation to axial scans of the larynx and trachea, and a static image. The creation of 2-D and 3-D images that are reformatted from the original CT scans can help overcome the limitations of the conventional axial CT views. Virtual endoscopy is not invasive, can produce views that are similar to those produced by conventional bronchoscopy, can evaluate the airways beyond a high-grade stenosis, and can be performed in patients who cannot tolerate bronchoscopy. Despite the advantages of 2-D imaging and 3-D virtual endoscopy, both techniques also have limitations; these are related to the maximal spatial resolution of 1.5 mm, the lack of color, and the inability to depict the mucosa. The appearance of the cartilages on CT and magnetic resonance imaging (MRI) scans also varies depending on the degree of ossification, which is not uniform and is frequently asymmetrical. MRI is rapidly becoming the definitive imaging modality for assessing tracheal and bronchial disorders in children. The advantages of MRI include noninvasive, high-resolution imaging with excellent soft-tissue contrast; the absence of ionizing radiation; and the identification of vascular structures without the necessity of administering iodinated contrast media. Unfortunately, standard MRI has a limited ability to depict dynamic organs, requires the use of long acquisition times, is very expensive, and is prone to motion artifacts in the images. Real-time, dynamic, cine MRI (CMRI) techniques, however, may serve as useful adjuncts for imaging moving structures. Tracheal stenosis is displayed in the MRIs below. 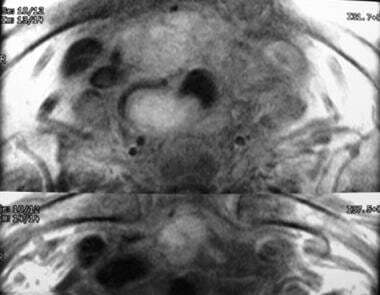 This magnetic resonance image was obtained from a patient with medullary thyroid carcinoma. The image shows significant compression and invasion of the trachea. This axial magnetic resonance image was obtained from the same patient as in the previous image. The image shows posterolateral invasion of the trachea. Using CMRI, Faust and colleagues assessed airway patency and function in a study with 30 patients, equally divided among pediatric patients, adult patients, and volunteer controls. The patients who were enrolled for tracheal evaluation fell into 2 groups, those with intrinsic pathology, such as tracheomalacia, and those with extrinsic compression. Depending on the patient's clinical history, endoscopic findings, and static MRI findings, the authors were able to obtain CMRI axial, coronal, and sagittal images during the patients' quiet respiration, as well as during a variety of provocative maneuvers. The imaging findings were correlated with endoscopy when possible. On CMRI, dynamic tracheomalacia was seen as functional tracheal narrowing or collapse with a dynamic component; the findings coincided with the patient's respiratory cycle in all cases. In 1 patient, CMRI detected a dynamic component to a tracheal stenosis that was not appreciated by either static MRI or endoscopic evaluation. Tracheal compression that had a dynamic component and was caused by tracheomalacia, mass lesions, or anomalous vasculature was similarly demonstrated on CMRI, whereas static MRI frequently either overestimated or underestimated the degree of airway compromise that was visible with CMRI and endoscopy. Animal studies have confirmed that ultrasonographic morphometric measurements of the laryngeal lumen are reliable. The transverse diameter of the trachea in the neck can be visualized by ultrasonography, but the AP diameter cannot be assessed because the acoustic shadow that is generated by the air column obscures the location of the posterior tracheal wall. Grenier PA, Beigelman-Aubry C, Brillet PY. Nonneoplastic tracheal and bronchial stenoses. Radiol Clin North Am. 2009 Mar. 47(2):243-60. [Medline]. MacEwen W. Clinical observations on the introduction of tracheal tubes by the mouth instead of performing tracheotomy or laryngotomy. Br Med J. 1880. 2:122-4. Lindholm CE. Prolonged endotracheal intubation. Acta Anaesthesiol Scand Suppl. 1970. 33:1-131. [Medline]. Glazer HS, Siegel MJ. Diagnostic imaging of the trachea. In: Cummings CW, Fredrickson JM, eds. Otolaryngology: Head and Neck Surgery. 2nd ed. St. Louis, Mo: Mosby; 1993. Vol 3: 2243-57. Reilly BK, Holliday MA, Rock AN, Kang X, Shekhar R, Preciado DA. Three-dimensional direct laryngoscopy and bronchoscopy: enhanced visualization of the airway. JAMA Otolaryngol Head Neck Surg. 2013 Apr. 139(4):367-70. [Medline]. Faust RA, Remley KB, Rimell FL. Real-time, cine magnetic resonance imaging for evaluation of the pediatric airway. Laryngoscope. 2001 Dec. 111(12):2187-90. [Medline]. Giguère CM, Manoukian JJ, Patenaude Y, Platt R. Ultrasound and a new videobronchoscopic technique to measure the subglottic diameter. J Otolaryngol. 2000 Oct. 29(5):290-8. [Medline]. Gluecker T, Lang F, Bessler S, et al. 2D and 3D CT imaging correlated to rigid endoscopy in complex laryngo-tracheal stenoses. Eur Radiol. 2001. 11(1):50-4. [Medline]. Gustafson LM, Liu JH, Link DT, Strife JL, Cotton RT. Spiral CT versus MRI in neonatal airway evaluation. Int J Pediatr Otorhinolaryngol. 2000 Apr 15. 52(2):197-201. [Medline]. Lakhal K, Delplace X, Cottier JP, et al. The feasibility of ultrasound to assess subglottic diameter. Anesth Analg. 2007 Mar. 104(3):611-4. [Medline]. Xiong M, Zhang W, Wang D, Xu J. CT virtual bronchoscopy: imaging method and clinical application. Chin Med J (Engl). 2000 Nov. 113(11):1022-5. [Medline]. [Full Text]. Puchalski J, Musani AI. Tracheobronchial stenosis: causes and advances in management. Clin Chest Med. 2013 Sep. 34(3):557-67. [Medline]. Mizutani L, Yazawa K, Komatsu Y. Multidetector CT evaluation for the diagnosis of tracheal stenosis occurring shortly after intubation. BMJ Case Rep. 2012 Dec 13. 2012:[Medline]. Koletsis EN, Kalogeropoulou C, Prodromaki E, et al. 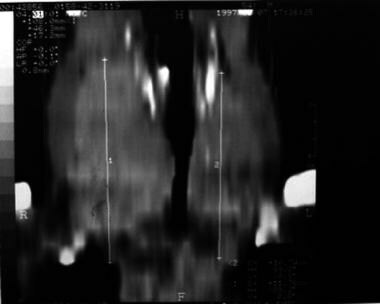 Tumoral and non-tumoral trachea stenoses: evaluation with three-dimensional CT and virtual bronchoscopy. J Cardiothorac Surg. 2007. 2:18. [Medline]. [Full Text]. Kirchner J, Laufer U, Jendreck M, et al. [Virtual bronchoscopy in the child using multi-slice CT: initial clinical experiences]. [German]. Rontgenpraxis. 2000. 53(3):87-91. [Medline]. Müller A, Herzau M, Litschko P. [How reliable is the measurement of tracheal stenosis by means of computed tomography?]. [German]. Laryngorhinootologie. 2000 Oct. 79(10):591-4. [Medline]. Taha MS, Mostafa BE, Fahmy M, et al. Spiral CT virtual bronchoscopy with multiplanar reformatting in the evaluation of post-intubation tracheal stenosis: comparison between endoscopic, radiological and surgical findings. Eur Arch Otorhinolaryngol. 2009 Jun. 266(6):863-6. [Medline]. Godoy MC, Saldana DA, Rao PP, Vlahos I, Naidich DP, Benveniste MF, et al. Multidetector CT evaluation of airway stents: what the radiologist should know. Radiographics. 2014 Nov-Dec. 34 (7):1793-806. [Medline]. Shimizu Y, Kamiyoshihara M, Okajo J, Ishii Y, Takise A. Tracheobronchial stenosis evaluated by inspiratory and expiratory three-dimensional computed tomography and impulse oscillation with three-dimensional color imaging in a patient with relapsing polychondritis. J Biol Regul Homeost Agents. 2014 Apr-Jun. 28 (2):325-31. [Medline]. Noyek AM, Witterick IJ, Fliss DM, Kassel EG. Diagnostic imaging. In: Bailey BJ, Pillsbury HC, Driscol BP, eds. Head and Neck Surgery: Otolaryngology. Philadelphia, Pa: Lippincott-Raven; 1993. 82-91. Profili S, Manca A, Feo CF, et al. Palliative airway stenting performed under radiological guidance and local anesthesia. Cardiovasc Intervent Radiol. 2007 Jan-Feb. 30(1):74-8. [Medline]. This stenotic tracheal segment was obtained from a patient who underwent surgical resection and end-to-end anastomosis. This resected tracheal segment is the same as that in the previous image. This resected tracheal segment demonstrates a luminal obstruction that is greater than 90%. We would like to thank Sergio Castro-Ibarra, MD, for his previous contributions to this article.